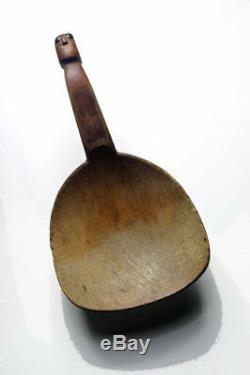 Here you find a lovely maple feast ladle dating to the 1800's. 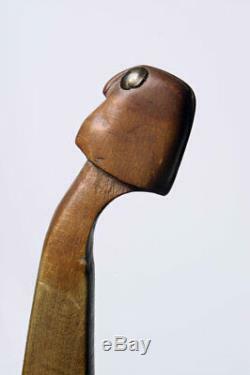 The handle is carved into a well detailed head. European brass trade tacks were used for the eyes. Has a beautiful rich patina from age and use. 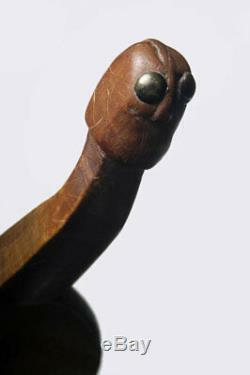 Measures 9.5 inches in length. Feasts were important ceremonies among the Woodlands people and their purpose was to give thanks for what they took from nature in order to live. For instance, when sap was gathered from maple trees or wild rice harvested from lakes, they held feasts of thanks and gratitude. Each person attending a feast brought their own carved ladle. 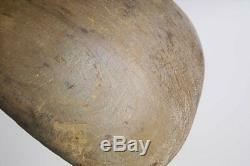 The item "Great Lakes Ojibwe Effigy Feast Ladle circa 1800's Ojibwa" is in sale since Tuesday, March 13, 2018. This item is in the category "Antiques\Ethnographic\Native American". The seller is "www-galleriadelvecchio-com" and is located in Mississauga, Ontario. This item can be shipped worldwide.